With a simple design this men's figaro link stainless steel id bracelet is a smooth way to add a little extra appeal to your appearance. 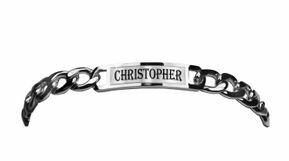 This stainless steel personalized identification bracelet is a great gift for any occasion. Fits Wrist Sizes: Adjustable 8.0 in. Finish: Shiny - Polished Stainless Steel Clasp Type: Lobster Link Style:Curb Plaque Dimensions: 1 1/2" x 0.5" Bracelet Length: 8.0"